When I'm deciding on exhibitions to visit, accessibility and a public audience's benefits are usually high on my list of priorities. The prints of the late Michael Peel will not only appeal to a large audience, but despite his death in 2017 they hold values of protest and a commitment to education that transcend the years. With a title as direct as 'States of Fear', the parallels to the world we're living in today are undeniable and instantly resonate, from a point of protest and propaganda, as well as Peel's sharp, bold graphic aesthetic. 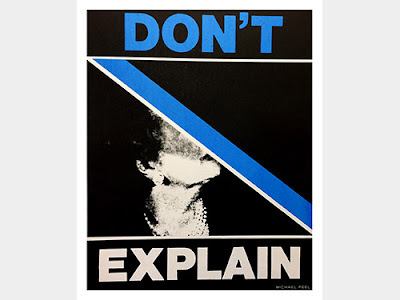 Michael Peel, Don't Explain - Modern World, 1988. Screen print, dimensions variable. Standpoint Gallery have done a fantastic job of curating the print work; in parts the display is very sharp with a taste of 'high art', yet still pays homage to the nature of protest and political exposé, in a similar style to how the Design Museum styled their exhibition 'Hope to Nope' earlier this year. Aside from graphic posters, photomontage pieces of different types of explosion are as potent as you'd expect, with the added morose angle that we are battling a growing indifference towards such images due to the over-saturation of traumatic and violence imagery in the media. 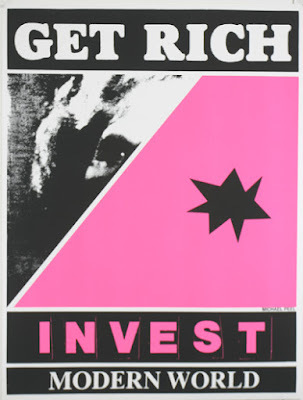 Michael Peel, Get Rich, Invest - Modern World, 1990. Screen print, dimensions variable. Towards the back of the gallery, Peel's protest-sized works are presented almost like a collage, or in real world context, the curation resembles the pasting of multiple political or popular culture posters in densely populated urban spots around town. 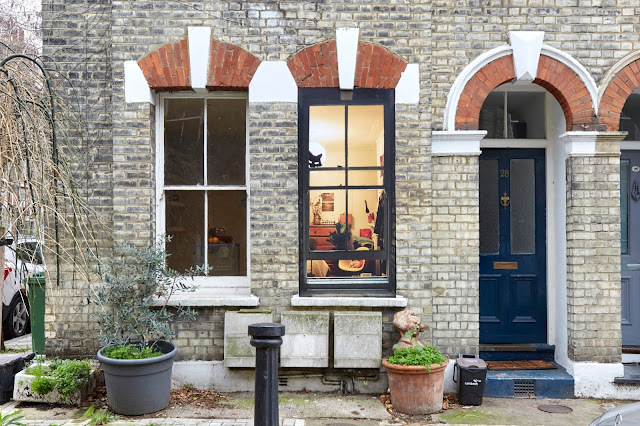 Shoreditch is certainly one of them, so Standpoint Gallery's location nearby is apt and engaging in this way. The idea of manifesting culture as well as reflecting and representing it through fine art is definitely one that should be utilised more; with the use of Theresa May, Margaret Thatcher and the like, Peel's political stance is clear and 'States of Fear' really does encapsulate the feelings of uncertainty, betrayal and precarity that are prevalent at the moment. 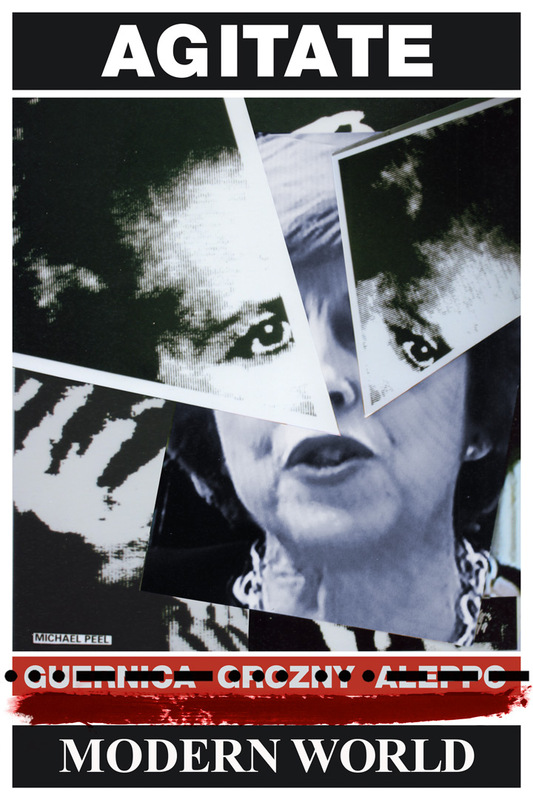 The role of the reproducible image is very much a part of that, as we saw with the 'Leave' campaign's output during the Brexit referendum in 2016; it was hyperbolic and abhorrent. 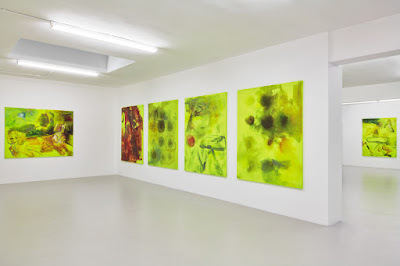 Though this posthumous solo show is brief, it is powerful in both aesthetic and message. 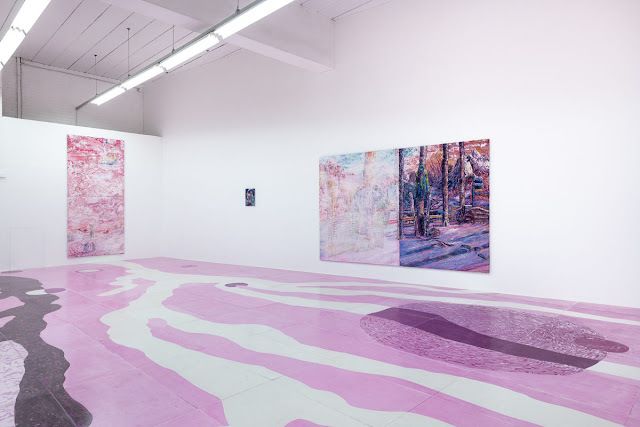 Certainly, Peel's work boils down the ongoing political rhetoric and subsequent actions to a strong visual identity with no room for interpretation or miscommunication, uniquely making his practice a powerful tool for past, present and future audiences. Michael Peel, Agitate - Modern World, 2016. Screen print, dimensions variable. Image courtesy of Flying Leaps.